Afghan Javelinmen, are hardy and fierce tribesmen from tribes either allied or captured by the Timirids. 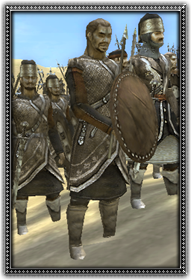 Used to a harsh existence, these wild warriors are excellent skirmishers. They excel at hurling their javelins at their foes, weakening units and breaking up formations, but can fight in close combat when the situation demands.